I have always liked peas. I’ve eaten plenty of split pea soup in my life, too, but I wasn’t in the mood for something heavy in the middle of summer. Finding this recipe for cream of pea soup seemed like it might be just the right solution for a light summer meal. What I don’t like about most cream soups is they taste mostly like cream. It’s like the vegetables were there just to make your mother, or nutritionist, happy. I wanted more robust vegetable flavor. According to America’s Test Kitchen, processing the raw veggies before adding them to the soup helps add flavor and reduce cooking time. Certainly the flavors in this cream of pea soup recipe were brighter and fresher than I expected. This recipe uses frozen peas, but you can substitute equal amounts of other fresh or frozen vegetables. Broccoli, asparagus, or carrots also make delicious cream soups. You could even try combining them. If you use fresh veggies, I recommend blanching them before chopping them. Peel and mince the onion into very small pieces and set aside. Place the peas in a food processor and pulse until chopped fine. Melt the butter in a large cooking pot or Dutch oven over medium heat. Add the onion and 1/2 tsp salt and cook until softened, stirring occasionally, about 5 minutes. Stir in the flour and cook for 1 minute more. This removes the “raw” flavor of flour. Slowly stir in the chicken broth, scraping any browned bits (fond) from the bottom of the pan. Bring to a simmer, cover and cook for 5 minutes. Add the peas and simmer until tender, about 8 to 10 minutes more. Puree in batches in batches a food processor or blender. Alternately, you can use a hand blender. Return the pureed soup to the pot and stir in the cream. Bring the soup to a brief simmer, then remove from the heat. Season with salt and pepper to taste. Garnish with chopped parsley or chives. Makes 6 main dish or 8 side dish servings. I like eating cream soups with crusty bread and butter. It makes an excellent light lunch or dinner. For a vegetarian version of this soup, substitute vegetable stock for the chicken stock. Finishing our tour of homemade, regional herb and spice mixes, we find ourselves traveling through Asia. The flavors are exciting, spicy, and will make your taste bugs tingle. Even though all the spice mixes in this series are regionally inspired, that doesn’t mean they won’t work well in dishes from other countries. The following Shanghai blend, for example, works equally well to kick up Mexican dishes. As with the previous flavor stops in Europe, the Mediterranean, and Northern Africa, to make these you’ll want a quality coffee/spice mill and spice jars. One of hottest spice mixes in this series, it’s an excellent choice for adding kicking up the heat in any dish. I especially like it on eggs. Fenugreek is sometimes hard to find in my town. If you have trouble finding it, just leave it out. I enjoy using this blend in rice dishes, or any time I want to get a hint of curry without the curry. This blend provides a nice alternative in stir fries, satays, fish and tofu dishes. 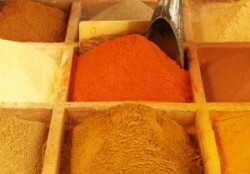 I hope you’ve enjoyed our tour of the flavors of the world through these spice mix blends. To some, mixing your own spice blends has probably seemed odd, while other may consider it being lazy. It’s neither. Instead, they provide a quick and easy way to add variety and excitement any meal. Photo by abcdz2000 via sxc. Fresh from our short tour of the flavors of the Riviera, our next stop on the spice mix tour takes us across the Mediterranean to coastal North Africa. If you missed the first two installments in this homemade herb and spice mix series, you can always go back to visit Europe and the northern Mediterranean coast. 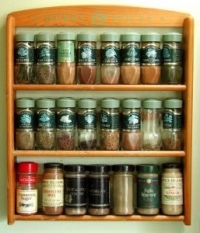 As always, you want a good spice mill and spice jars to blend these for yourself. This distinctive mix is excellent in meat and/or vegetable stews, served with rice or couscous. I wonder if Bogey used this in Casablanca? Harissa is actually a spicy chili sauce hailing from Tunisia. This dry spice variation is excellent. It adds a unique flavor, as well as a nice amount of heat, to any dish. Last time, I introduced you to Graham Kerr ’s idea of Ethmixes , herb and spice mixtures based on regional flavors to quickly spice up your meal. I gave you two Norther European blends so, this time let’s travel south and visit the Mediterranean. Ah, flavors of the Riviera … yum! As with the previous blends, you’ll want to use a good spice grinder. This mix adds great flavor and complexity to almost any dish. This is an excellent go-to blend for any Italian themed dish, especially tomato based pasta sauces. I also like it with sauteed vegetables. This is a surprising alternative for beef, lamb, and fish dishes. It’s great for flavoring a rice pilaf, too. The Greeks invented the edible complex, didn’t they? Next time we’ll cross the Mediterranean into coastal North Africa. Are you ready for homemade Harissa? Quickly putting together a meal sometimes means whipping up whatever is on hand. Even if you plan meals in advance, life gets in the way sometimes and plans have to be changed. It’s not your fault. That’s just modern life. Quick meals don’t have to be boring meals, though. 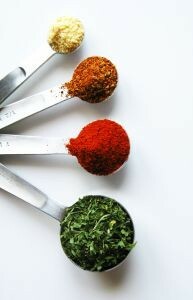 Changing the herbs and spices is a great way to add flavor variety to our lives, especially when improvising. Instead of endless trial and error, trying to figure out which spices go with what herb for what dish, try using a pre-made spice mix. Just don’t rely on the ones at the grocery store. In his book Swiftly Seasoned , Graham Kerr introduces the idea of “Ethmixes,” spice and herb blends based on regional flavors and made at home. I love this idea. They’re a wonderful addition to the cooking arsenal, quickly adding depth of flavor and variety. Here are two of my favorite European blends. They are based on Graham Kerr’s recipes, modified for availability of ingredients, amounts likely to be used within a year, and my own tastes. I’ll share more of my mix variations in the coming days. 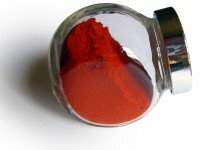 Making your own spice mixes is easy. You will need some equipment that you may not have purchased before, though. First is a good coffee/spice mill . I don’t drink coffee, so I only need one. If you grind your own coffee, though, buy a separate mill or your coffee will have the peculiar flavor of herbs and spices. The next is a collection of empty spice jars . Almost any small jar with a tight lid will do. If they are UV resistant, that’s even better. Mark your jars with the date you create the mix. Use them within 6 months to a year. After that, the flavors will weaken and some will simply become stale. Ick. For each of the following mixes, simply combine the ingredients in your spice mill and grind into a fine powder. With some mixes, you will mix in addition ingredients after you grind the others. Some herbs instill better flavor if used that way, instead of being ground. This one is much simpler that Graham Kerr’s version. I enjoy it in fish dishes, vegetable soup, and almost everything else. Grind into a fine powder. I like this mix as a rub for roasts or in meaty stews. Stay tuned. I'll be sharing more spice mixes, next time. Polenta can be quite a nice treat, either as a side dish or main course. It’s odd to think that this much sought after, and sometimes expensive, dish began life as congealed corn much. Yup! Let hot corn mush harden and you’ve got polenta. Italians don’t only each it after it’s firmed up, though. Intelligent foodistas that they are, they enjoy it hot from the pan as well, as creamy polenta. It’s the ultimate comfort food. Contrary to what some may tell you, the best polenta is made from coarsely ground cornmeal. If you like eating craft glue, by all means, use a fine ground cornmeal. Otherwise, stick with a course grind. Stone-ground cornmeal is a close second choice, but because of it’s uneven grind, you get uneven results. One of the nice things about this recipe is that it's so easy. My ten year old made the polenta you see pictured. Cut the butter into large chunks and set aside. Grate the cheese with a fine rasp grater or microplane. You should end up with about 1 cup of grated Parmesan. Bring 6 cups water to a boil in a medium saucepan. Add 1 1/2 tsp salt. Slowly add the cornmeal, whisking the whole time to avoid clumps. Reduce to a simmer, stirring constantly. Cover and reduce the heat to low. Continue stirring often, making sure you get into the corners of the pan, until the polenta is smooth and soft. This can take anywhere from 5 to 30 minutes, depending on the humidity and corn meal. Taste to check if it’s done. It should have a warm toasted corn flavor and be smooth in texture. Stir in the butter and grated Parmesan. Season with additional salt to taste and serve. Serve with additional Parmesan cheese, your favorite marinara sauce, or with any other desired toppings. I posted a recipe for the firmed up version of polenta, earlier. I like this mash recipe better. If you want firm polenta, you can allow this mixture to cool, cutting it into squares and frying just as I did in the original recipe. A man orders breakfast in the hotel he’s staying at and calls over the waiter. "That's quite a strange order sir," the waiter says. "It might be difficult to fill." "Really?” the guest replies. “I don't understand. That's exactly what I got here yesterday when I ordered two boiled eggs with bacon, toast, and orange juice." How can you go wrong adding bacon to green beans? I haven’t got a clue. This delicious side dish goes well with almost any entree. The addition of cider vinegar and brown sugar makes the flavor pop. This recipe uses canned green beans for convenience, but fresh ones are always the best choice when you can get them. If using fresh green beans, trim the ends and then cut in half, widthwise. Increase the chicken stock to 1 cup and increase the cooking time to 5 minutes. Peel and mince the onion into 1/8 inch pieces. Drain the green beans. Cook the bacon in a 12-inch skillet over medium heat until crispy, about 8 minutes. Turn the bacon over a few times during cooking. Transfer the bacon to a paper-towel-lined plate to cool. When cool enough to handle, chop the bacon and set aside. In the same skillet, cook the mined onion with a pinch of salt until translucent and starting to brown, about 8 more minutes. Add the drained green beans, broth, vinegar, brown sugar and thyme, along with 1/4 tsp salt and 1/4 tsp ground black pepper. Bring to a brief boil. Lower the heat to medium and cook until most of the liquid evaporates, 1 to 2 minutes. Season with salt and pepper to taste. Unlike that tasteless joke, these lemon bars are full of flavor. Creamy, refreshing, and not too tart, they’re a perfect summer dessert. They were a hit with my kids and I think yours will enjoy them, too. I use bottled lemon juice for these bars out of convenience, but you can certainly use fresh lemon juice. Tossing some lemon zest in with the lemon juice will only improve the flavor. You’ll need 4 fresh lemons and 1/4 cup grated lemon zest. Cut all of the butter into small pieces and place on a small plate or bowl to soften, about 30 to 60 minutes. Keep the butter for the crust separate from the butter for the filling to make it easier later on. Place an oven rack in the middle position and preheat the oven to 350 °F. Line the baking pan with two long sheets of aluminum foil, perpendicular to each other, with extra foil hanging over the side to make a foil “sling.” This will make it easier to remove, later. Make sure the foil is pushed into the corners and smooth against the sides and bottom of the pan. Coat the sides and bottom with cooking spray. In a large mixing bowl, combine flour, 1/2 cup powdered sugar and 1/2 tsp salt. Add 8 Tbl of the softened butter and mix with clean hands until the butter is incorporated and the mixture looks like course cornmeal. Sprinkle the mixture into the prepared pan and spread evenly across the bottom with your fingers. Put in the oven and bake for 20 minutes or until it just starts to brown. While the crust bakes, whisk together the egg yolks and whole eggs in a medium saucepan. Whisk in 1 cup plus 2 Tbl granulated sugar until well combined. Whisk in the lemon juice and lemon zest, if using, along with a pinch of salt. Add the rest of the butter and cook over medium low heat until slightly thickened and registering 170 °F on a thermometer, about 5 minutes. Immediately pour the mixture through a strainer into a mixing bowl, pushing the liquid through with a rubber spatula. Stir in 3 Tbl heavy cream. Remove the crust from the oven and pour the hot lemon filling over it. It’s important that both the crust and the filling be hot to prevent the crust from getting soggy and the lemon curd cooked properly. Bake until the filling is shiny and jiggles only slightly when shaken, about 10 to 15 minutes. Remove from the oven. Place the pan on a wire rack and let cool in the pan about 2 hours. Remove the lemon bars from the pan using the foil sling to gently lift them out onto a cutting board. Cut into 9 squares. Dust with additional powdered sugar before serving. Recently, food co-op Rawesome in Venice, California was raided by the FDA for selling raw milk without a permit. This has re-kindled the on-going debate about the safety of raw milk, the operations of the FDA, and the individual liberties of Americans. It should be noted that this is not the first time Rawesome has been raided. They were similarly raided in 2010. The recent raid raid came as a result of a sting operation the FDA has been running there for the past year, presumably since the first raid occurred. While this seems to be a question of proper permits, the question of raw milk consumption is a debate between food safety and potential health benefits. After the discovery of germ theory in the 1890’s, milk was pasteurized to control the potential hazards of highly contagious bacterial diseases, including bovine tuberculosis, that could be easily transmitted to humans through the drinking of raw milk. At the time, no product testing was available to determine if a farmer's milk was safe or infected so, all milk had to be treated as potentially dangerous. In the United States, milk pasteurization was widely used in the 1920s and it was considered a major breakthrough in public health. Pasteurization has been credited with reducing infectious disease rates in the U.S. more than 90% over the past century. In 1924, Grade A pasteurization became a recommended federal policy, but interstate commerce of unpasteurized dairy products was not limited via federal legislation until 1987. Pasteurized milk is heated to 161 °F for 15 seconds, killing harmful bacteria, such as E. coli and salmonella, sometimes found in milk. The pasteurization process, however, also destroys some vitamins as well as healthy bacteria, such as L. acidophilous. Exposure to harmful bacteria present in some milk can lead to tuberculosis, listeriosis, salmonellosis, and several other food borne illnesses. The symptoms range from nausea, to diarrhea, to death. 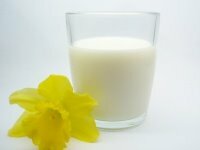 According to the FDA, in 2002 there were nearly 200 deaths that could be directly associated with exposure to such bacteria by drinking raw milk. Pasteurization also kills many bacteria that lead to spoilage, contributing to a longer shelf life. Pasteurization isn’t discriminatory in killing bacteria, however. It also kills “helpful” bacteria, such as L. acidophilous, used in culturing yoghurt and cheese. Milk products with L. acidophilus, have been associated with a decrease in pediatric diarrhea, decreased levels of toxic amines in the blood of some dialysis patients, aids in lactose digestion and has been linked to a a reduction in certain risks associated with coronary heart disease. The FDA maintains that the benefits of pasteurization far outweigh the loss of health benefits. L. acidophilus can be found in pasteurized yoghurt and cheeses. Some raw milk advocates cite government regulation of raw milk consumption as a threat to civil liberties, noting that adults are allowed to consume more dangerous substances. The debate over raw milk is interesting. On the one hand, the benefits of destroying pathogenic bacteria in our food supply can’t be ignored. On the other, such bacteria can be re-introduced if the milk is handled improperly after pasteurization. Such bacteria is not present in all milk and there are several tests available to check for it before the milk is put in the refrigerator section of stores. My own experience with consuming raw milk has been limited. There are a few farms in Utah that are licensed to produce and sell raw milk. They use incredible handling procedures to ensure it’s safety, going miles beyond the norm to maintain proper temperatures. By law, they make you sign a waiver sto ensure you know the risks, and they don’t sell to minors. I have occasionally purchased and consumed milk from them. Growing up, my grandparents and at least one uncle kept cows. Drinking fresh, raw milk while visiting them was not uncommon. They would pasteurize the milk in large batches on the stove before serving it, from time time, as well. I have never gotten sick consuming raw milk. As for taste, I don’t find much difference. There’s a greater taste difference between organically produced milk, pasteurized or not, and other milk. Different brands have different tastes, as well. I’m guessing this is due more to the diet and living conditions of the cows than anything else. I prefer the organic variety, but it’s more expensive so, I purchase it as a treat, not a staple. Currently, I want a legal choice between raw and pasteurized milk, as long as food production and sanitation guidelines are being held to the highest standards and enforced. It’s insane to think that we have to sign a waiver to buy raw milk, but adults can buy cigarettes without signing anything. Raw milk with cookies? Evil! Cigarettes and whiskey? Go ahead and kill yourself, we don’t care. It’s ridiculous. That doesn’t mean I’m riding on the FDA’s anti-raw milk bandwagon. I think the current policies and enforcement are too heavy-handed and hurt small, local farmers. The fact that the FDA uses federal tax dollars to help states that actively seek to counter raw milk consumption is an indirect way of pressuring states to give up the authority to govern food commerce within their own states. That’s a debate for another day, though. I’d like to hear your opinion. Please share your thoughts with us by leaving a comment, below. Ah, the classic egg salad sandwich. Easy to make, yummy to eat. My wife certainly loves them. I'm pretty fond of them, too. You don’t have to put egg salad on bread to enjoy it. It works nicely as a light side. If you’re not watching your carbs, though, why not? Toasting the bread first is nice, too. The secret in this simple recipe is not to chop the eggs too finely. Keep it course or they will dissolve into the dressing. Cut the celery stalk into long thing strips, then cut the strips crosswise into very small pieces. Mince the onion into 1/8-inch or smaller pieces. Cut the eggs in half, lay them on their side and coarsely chop. Mix the mayonnaise, chopped celery, minced onion parsely, 1/2 tsp salt, pinch of pepper, mustard, and lemon juice in a large mixing bowl. 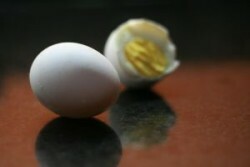 Gently fold in the eggs. Season with addition salt and pepper to taste. Spread on bread to make sandwiches, or eat as a cool summer side dish. Makes 4 cups of egg salad, enough to make 6 sandwiches.